Sydney is one of the world's great cities. Built around an incredible harbour, it's most peoples starting point in Australia. It offers incredible beaches, wildlife and beautiful national parks. It's been our home for over four years, and we want to share our favourite places with you, so here's our ultimate guide to Sydney. Visitors to Australia need a visa. It's a simple process online that allows you to visit for 3 - 6 months. Just visit the immigration website to apply. Australia's seasons are the reverse of the Northern Hemisphere, with winter from June - August and summer from November - February. Sydney's climate is one of the more temperate in Australia and doesn't have a rainy season or the significant range of temperatures that Tasmania and the South have. The summers can be very hot, but daytime temperatures rarely drop below 15C. In our opinion, late winter/early Spring is the best time to visit Sydney. It's the time of year with the least rainfall and you'll have day time temperatures between 18C and 25C. This means you can do active things outdoors without the fear of heat exhaustion! Accommodation is usually significantly cheaper and you can also catch the tail end of the whale migration season. Summer can see temperatures soar to the mid 40s, so this is really only a good time to come if you predominantly want a beach break. 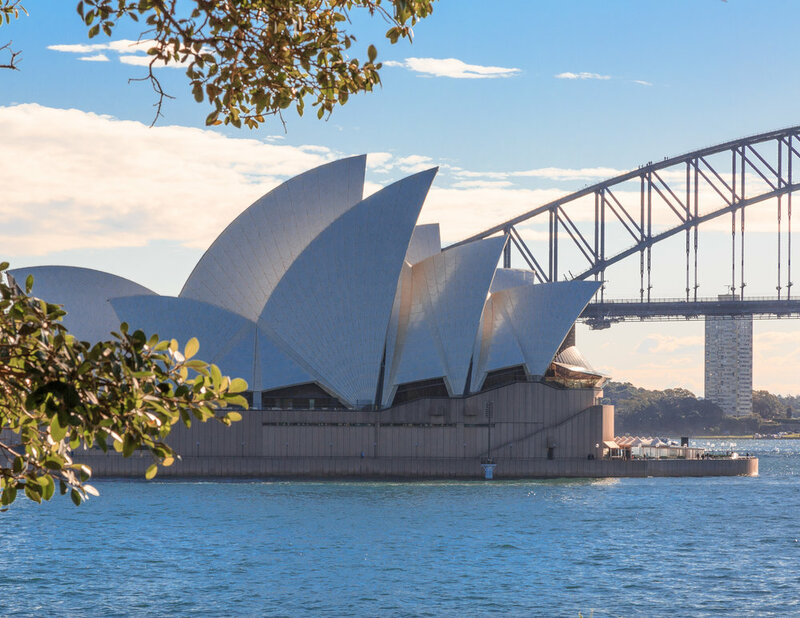 Overall though, Sydney is an all year round destination, and you'll have a great time no matter when you visit but if you can choose, Spring is our pick. A month to avoid would be November. The five November's we have spent here have all been really wet, coincidence maybe but five in a row...? Sydney is one of the most expensive cities in the world. We've written a blog all about our suggestions to have an amazing time on the cheap but there's also plenty of once in a lifetime splurges we'd recommend too. Parking: Sydney is one of the most expensive places in the world to park. Avoid if possible. Train: $4.20 one way within the inner city with Opal card. Sydney has a diverse offering of accommodation, but few are cheap. The key is picking the right suburb for the kind of activities you want to do. For example: The Rocks, Circular Quay and the CBD are excellent for getting around, most places will be walkable and the inner city transport links are very good, but the cost is significantly higher. Similarly, Bondi & Manly are going to be the best places for a beach trip, but getting anywhere else will take a lot more time. If you want a balance of cost and location, then areas such as Paddington, Darlinghurst and Kings Cross will suit you. They're equidistant between the city and eastern beaches, and they're the places you're most likely to snag a deal. Strategically, the best way to save money is to visit midweek and during the off-peak seasons such as during Winter (also avoid Australian school holidays or Vivid which runs at the end of May and into June). The Cambridge has a great location, being a stone's throw from Crown St and the CBD. It's a lovely, modern hotel and makes a good mid range option. This is where we stayed when we first arrived. It ticks the box for value as well as being very central and clean. The rooms are pretty basic, but if cost is your motivator you'll be hard pressed to get a better room deal than the Devere. We ended up staying here for the same price we were originally paying for two dorm beds! Hostels in Sydney provide a cheaper option especially for solo travellers and are of a very high standard. However, most hostels in Sydney are full of party-goers and people on their gap year, so don't expect to get an early night's sleep! Bounce is one of the best hostels there is in Sydney. The rooms are modern, well maintained and the common rooms are very good, as is the kitchen. It's in the perfect location as well, being right next to Central Train Station and in the heart of Sydney's hipster area - Surry Hills. Another well maintained hostel with decent rooms and common areas. It's also based in Surry Hills and is a good place to get your bearings in Sydney. The only downside is that we found that cliques developed between people who stayed there long term, but this may well have changed by now. Value wise this was the best hostel we stayed in. This is arguably the best thing we've done in Sydney and the best way to get those perfect postcard views. It's not cheap, but on a clear day there's no better view in the city. It's worth investing in a longer flight and adding the beaches on, seeing the likes of Bondi Beach from above is truly special (think perfect blue water with lots of colourful little surfers, we even saw whales!). An iconic walk, and one which my parents demand we do as soon as they land to get over the jet lag. Bondi to Coogee not only takes you over some of Sydney's best beaches, it offers incredible views from the cliffs including the opportunity to see dolphins and whales (if you're lucky and here in season, May to October). We've done this hundreds of times and it never gets old. It's a pretty easy walk, a few ups and downs but nothing too strenuous, so there's no excuses! The best way to do it is by getting the 330 bus from Circular Quay to Bondi. You can then get a bus back from Coogee to Central or grab a taxi. Another brilliant place to stretch the legs, the Botanic Gardens is conveniently situated between the Opera House and Woolloomoloo. Taking a stroll through the gardens offers some of our favourite views of the harbour away from the bustle of the CBD. It is also a great place to see local birds and to start making your way through this list of colourful birds you can see in Sydney. The walk along the shore is short, flat and can finish at the Woolloomoloo wharf, which has some of Sydney's swankiest restaurants (Otto and China Doll) as well as a great bar. If you were looking to head in to the Aussie Bush, then check our guide to the best hikes just outside Sydney. Sydney has some of the best whale watching in the country with thousands of whales migrating just outside the harbour every year (sometimes they even come into the harbour!). Most trips guarantee sightings or offer another trip for free and if you're really lucky you'll see them breach. The boats are well equipped and it's a good way of combining a harbour tour with wildlife watching. The other bonus is that it takes less than half an hour to get to the whales, so you won't need to worry about a long journey which maximises your time spent with these magnificent animals. Bring seasickness tablets if the water is looking choppy! If you want to find out more about the boat trips as well as spots close to Sydney, check out this guide on the perfect places to see whales. There are plenty of places in Sydney to have a drink with a view, but our favourite has to be at the top of the Shangri-La hotel. Here you get a stunning view of the whole harbour and from a really high vantage point. It's a great place to go at sunset. This photo was taken at their restaurant, Altitude, which is an amazing dining experience but you can also just visit the bar if you don't want to fork out for dinner. A trip to Sydney isn't complete without a trip to one of the many beautiful beaches. The obvious two are Bondi and Manly, but there are many others worth looking at as well. We love Palm Beach for it's space and scenery, Shelley for it's snorkelling, Curl Curl for it's incredible rockpool or Garie for a more wild beach situated in nearby Royal National Park. If you want to go further out, you can visit one of New South Wales' many magnificent beaches. The Blue Mountains are a must for any visitor to Sydney and is one our favourite places in Australia. It's not just amazing hiking, you can visit incredible viewpoints, wildlife or even the huge caves at Jenolan (which also have a wild Platypus you can see if you get lucky). If you aren't a fan of hiking you can visit Scenicworld and ride the steepest train journey in the world and take the cable car across the valley, all the views for none of the work! This was a favourite of our niece and nephew when they visited us. You can also check out several of the many great Instagrammable spots or the amazing lookouts we've hunted down after four years of living in Sydney. If you want to try a local Aussie wine and are visiting Sydney, then the Hunter Valley is for you, it is one of our favourite weekend getaways. Famed for it's Chardonnays, Semillon, Shiraz and Pinot Noir, it's an interesting wine region that's just two hours north of Sydney and set up for cycling around the vineyards. It's a place to relax and indulge yourself with great restaurants and produce shops as well as the wineries. Most wineries let you taste the wines for free, a couple of the more famous ones such as Brokenwood charge $5 which is deducted from the price of a bottle if you make a purchase. The area is vast, if you have a short amount of time we recommend staying somewhere around Polkolbin which is very central. Our favourite wineries include Gun Dog, Brokenwood, Audrey Wilkinson (for the amazing view) and Scarborough Winery (for the sunset view). If you're looking for an amazing brunch try Cafe Enzo. It's our go to on a Sunday. If you prefer somewhere a little off the beaten track you could always visit Broke. This has one of our favourite dining experiences at Margan Winery. They focus on local produce and you can taste the difference. If you visit in winter there's a roaring log fire. Our top recommend for wineries here include Krinklewood and if you can spare the time as it's a little further away, Ascella organic winery. Fancy a picnic in the middle of Sydney harbour? Visiting Shark Island is a really memorable way to spend the afternoon. There are a few ways you can get there. The first is with Captain Cook Cruises from Circular Quay, the second would be by water taxi (this is the option we chose but it's very expensive unless you have a big group, you'd want at least 10 people to make this option worth it) or possibly the most fun would be to hire a kayak and paddle there from Rose Bay. This is a bit of an institution in Sydney. On a sunny day (which lets face it is most of them) people head out in droves to try and snag a seat with a view and while away the hours eating, drinking and watching the sunset. It's a really picturesque location and the food and drink is good too. There's also a couple of short walking tracks nearby if you want to make a whole day of it, our recommend would be the South Head Heritage trail. This takes you passed sheltered coves and round to the lighthouse. Watching the huge waves crash against the rocks from the lighthouse is something you won't forget in a hurry. Cockatoo is another of our favourite harbour islands. It's easy and cheap to get to as the public ferry goes there. You can visit for the day and take a look round the historic buildings, it's a former convict colony. There are audio guides but we were happy just to wander, there are loads of info boards if you want the full history. The views from the island are, as you would expect pretty epic. If you have a night to spare camping on cockatoo island is a must. You can bring your own tent, hire one (ready set up) or even go glamping. Get there early to have a pitch right by the waters edge. We had a regular tent and the view was terrific. It's also a special place to be at night when the day trippers have all gone home. We chose to take our own food and use one of the many communal BBQ's although there are a couple of cafes on the island. Catching a sunset and sunrise from the island is not to be missed. Vivid is the best festival in Australia in our opinion and the perfect time to see Sydney. For three weeks, Sydney has one of the best light projections shows in the world, displaying interactive stories and beautiful images on the Opera House, Harbour Bridge and many of the other iconic buildings. There's also interactive displays and the whole city has a buzz in the evening. The drawback is that hotel prices go up and you'll be here during the shorter days (sunset is around 4.30-5pm) and the coldest time of year (day time temperatures are around 15-20C and 10C at night, so don't come thinking you'll be getting a tropical heat!). We'll be honest, eating out in Sydney is an expensive affair. But the food is generally good, fresh and healthy. You can't go wrong with the amazing seafood restaurants which would be our number one choice. Mamak is an institution in Sydney and most evenings you'll see a pretty big queue if you turn up late. It serves great Malaysian food at a decent price and portions are huge! Make sure you get there when it opens, or be prepared for a bit of a wait. Don't miss the roti! For years, Circular Quay had a dearth of decent cheap places to eat, especially for lunch. In the last year Gateway has launched with a great selection of places for food on the go. Our favourites are Mad Mex for a Burrito, Din Tai Fung for dumplings and Bread & Fill for a rotisserie sandwich. Sadly most of Gateway shuts before dinner. Two words, Snapper Pie. This dish is reason alone to visit, but if you don't fancy pie you can choose from the extensive Oyster Menu (yes, this place allows you to pick the Oyster by the location) and the view of the Anzac bridge and Blackwattle Bay is fabulous. For a cheaper seafood option try Doyles either at the Sydney Fish Market in Pyrmont or at the beach in Watson's Bay. There are tables and chairs at the Pyrmont branch and at Watson's it's all about sitting on the beach. Tucked away in Surry Hills, Mama's Buoi serves some of our favourite Pho in Sydney. It's always busy, but it's worth the wait. Australia isn't great for curry, but if you're craving an Indian then Maya Da Dhaba in "Curry Hills" on Cleveland St is a great choice. There's a vegetarian equivalent just across the road from it too. Now this is a dining experience not to miss. it's a small restaurant and you'll likely have to leave a name and mobile number with the host to call you when a table becomes available (no bookings) but trust us, do it. Go grab a drink at nearby Bloody Mary while you wait. The menu at BM is all about the cheese. Even been served your pasta straight from a cheese wheel before? The entrees, mains and wines are all amazing, just go! Chur Burger has been a favourite in Sydney for a long time and it's easy to see why. It's become so popular that they've recently launched a restaurant at the domestic airport. The closest Sydney gets to Hawker food is Hawker Alley in Chatswood. It's a little far from the CBD, but you'll be able to get your choice of all kinds of Asian cuisine including dosas, dumplings, noodles and currys. There's also a branch of Tim Ho Wan nearby if want to try the cheapest Michelin star restaurant in the world. Coffee is practically a religion in Sydney and everyone has their favourite. It might surprise international visitors to know that we believe Australia serves up some of the best coffee in the world. Surry Hills has the highest number of great cafes, but you can find many choices around the city. In general, avoid the chains and look for the small independent options, although you will notice one chain made our list! If you're looking for a great brunch with a view, then look no further. The Bathers Pavilion over looks the beautiful Balmoral Beach in one of Sydney's swankiest suburbs. If you get there early enough you can snag yourself a window seat and tuck into one of our favourite Sydney brunches. If you visit Le Monde, you'll probably be greeted with a bit of a queue, but the wait is worth it. It originally became an institution by attracting hundreds of cabs from around the city to be their coffee stop of choice. Now it's still going strong and also serves a very good brekkie. Lox, Stock & Barrel is another popular local hangout, so it's best to turn up early or prepare for a wait. It's well known for it's freshly baked bagels, but the rest of the food on the menu and coffee it serves are also worth going for. It's a short walk from Bondi Beach, so makes for the perfect beach/brunch combo. The seed and spice bagels are to die for! If you've had your fill of avocado and sourdough, have a look at the small but sweet Rustic Pearl. This little cafe on Crown St offers up Turkish inspired dishes for brunch. You'll have to queue up, but you can always potter around Surry Hills while you wait, just make sure you put your name on the list at the door. It's also a short hop away from Messina if you fancy one of Sydney's best Gelatos for dessert. Ok, hear us out on this one. You probably didn't expect a European chocolatier to be on our list of favourite haunts. But it's one of the few places in Sydney that offer an armchair with your pastry to sit and chill for a while. And did we mention that the pastries come with a pot of hot dipping chocolate?! They're also close to key spots like the Opera House and Darling Harbour. Sydney's night life took a dramatic change when the lockout laws came in to place a few years back (this is a law prohibiting entry to bars or clubs after a certain time and limiting the number of late night licenses available). Areas such as Kings Cross have dramatically changed. If you're planning a late one make sure you check the timings online. Sydney is all about the eclectic and quirky small bars The best area is Sussex Street, where every other place seems to be a bar with a twist. Unsurprisingly as it's a record shop by day the music here is really good. The drinks at Mojo Record Bar are also top notch but it's also the novelty value we love it for. On Thursday and Fridays evenings you can order takeaway pizzas delivered to the bar! Amazing! A Sydney institution, Uncle Ming's has somehow made dumplings and cocktails the perfect combo. But it's not just a novelty, the dumplings served here are some of the best we've had in Sydney. For mood think underground cave style, decorated with buddha statues and candles. The Barber Shop is another Sydney institution and is pretty busy most nights of the week. It's well known for it's gin and whisky menus, but everything it serves is good. It is a European style bar and we love the relaxed vibe. There's a small outdoor courtyard for warm nights. Another York St favourite, Stitch is an underground bar decorated with sewing machines. Its serves up great cocktails and also really good food. There's a small amount of standing room at the bar and lots of booths. Expect a wait for a booth unless you get there early. You can make online bookings, easiest Mon - Weds, when bookings are allowed until 9.30pm. It's 5.30 and 5..00pm respectively for Thursdays and Fridays. What's not to like about a place which is part club, part pizza parlour?! Frankie's has been a Sydney favourite for a long time and you'll see why when you head downstairs and tuck into pizza and margheritas. Pizza is served by the slice so it has also become an after party hang out too, open til 3am. We strongly suggest pre-arranging an airport transfer before arrival as no shuttle buses or buses operate from the airport. If you turn up, you'll have two choices: a $40-60 taxi fare, or a $15 train fare (which will also need another form of transport as not many hotels are walking distance to the train station). If you get a taxi from the airport, check the route the driver is going. You can easily add on $10-15 in toll charges if you're staying somewhere in Bondi, Manly or north of the Harbour Bridge. Sydney is a very walkable city and the easiest way to get around is on foot. Most sights are close together and it's a good way to get a feel for the city. To get to places outside of the main CBD, you'll need another form of transport. Ferry: The best way to travel in Sydney. By using the public network you can get a harbour cruise for $7 each way and finish at some of the best spots in the city. The ferry is the best way to get to great locations such as Manly, Watsons Bay or Luna Park (Milsons Point). Train: The train network in Sydney is pretty good and will be able to get you to the main points (Town Hall for Darling Harbour, Circular Quay for the Rocks, Harbour Bridge & Opera House) and you can even go to the Blue Mountains by train. However there are large swathes of the city which it doesn't cover, such as the Eastern Beaches, Manly and Palm Beach. Good news if you're used to heaving public transport where you don't get a seat, it's rarely the case in Sydney even at commuter times. Bus: The bus is the best way to get to the Eastern Beaches (Bondi, Coogee, Maroubra etc) and Palm Beach (from the QVB). They can be a convenient way to get around the parts of the city which the train service doesn't service. Taxis and Ubers: Sydney has Uber, but our experiences have varied. Some are very good, many seem to get completely lost. The silver service taxis tend to be the most reliable and virtually always know the best ways round the city. Short journeys aren't too pricey and you can get around the CBD for about $10-20 per journey (depending on how far you want to go). Cars: If you plan to stay in the city, you won't need a car. Public transport is good and most major attractions are pretty close together. Sydney also has some of the most expensive parking in the world (prices of $50 per day are not unusual). If you are looking to go further afield (Blue Mountains, Hunter Valley or the South Coast), then car hire will make your trip a lot easier. Have you been to Sydney? What are your top picks for Sydney? Let us know in the comments below.